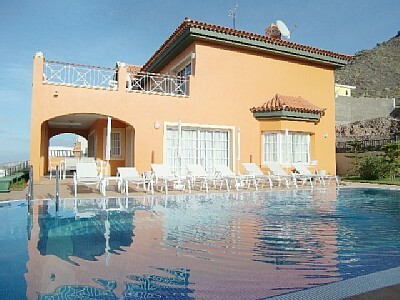 Villa Tara is a luxury five bedroom villa in the Costa Adeje resort in Tenerife. It has been fully refurbished to a very high standard and includes little extras which make all the difference to the enjoyment of a holiday. The villa is laid out over 3 levels. The ground floor master bedroom has a double bed and its own ensuite bathroom with jacuzzi bath. The lounge and kitchen are also on the ground floor and have been fitted with modern Italian furnishings. On the upper floor the first floor master bedroom has an attached reading room and large terrace which enjoys amazing sea views and is equipped with sun loungers, sun umbrella and a table and chairs for 4 people. There are also 2 twin bedrooms on this floor with extra large single beds. On the lower ground floor there is a separate studio apartment with its own entrance, consisting of 2 single beds, kitchen and bathroom. Outside there is a large private heated pool with sun loungers, as well as a covered terrace with patio table and chairs and a built-in barbeque for alfresco dining. All linen and towels are provided even bathrobes and pool towels. The owner can also provide 2 cots and 2 highchairs on request. All bedrooms on first floor with en-suite bathrooms with bathtub; Master bathroom ground floor with jacuzzi bathtub and shower cabin; Studio with attached shower room; Guest toilet. Hairdryers are provided in every bathroom. Italian made kitchen/breakfast room with Siemens appliances: 'American' fridge freezer, eye-level oven, microwave oven, ceramic hob, dishwasher, coffee percolator, toaster and kettle. Breakfast table seating six people. Spacious dining/living room furnished with three Italian leather sofas, 42" plasma TV, DVD player, HI-FI, selection of CDs and DVDs, books and games. Large dinner table seating eight people.